Musselman’s Natural Applesauce for Breast Cancer + GIVEAWAY! | Healthy Product Reviews!! Musselman’s Natural Applesauce for Breast Cancer + GIVEAWAY! Here’s a special pink post dedicated toward Breast Cancer! Musselman company sent me a very nice gift basket with a GIANT bottle of Natural Applesauce (48oz), some recipe cards, and a Pink ribbon magnet (that I immediately placed on my car 🙂 ), along with a bunch of pink fuzzies (those paper things that protect the package…haha. I loved em!) to show their care for Breast Cancer. 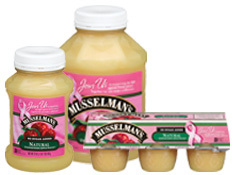 Musselman’s is having a big promotion during the month of January and, are donating ten cents to the National Breast Cancer Foundation (NBCF) for every package of Musselman’s Natural Apple Sauce that is bought during the month of January. Ten cents may not seem like a lot, but it really is, and every bit makes a difference. This money will be given to the NBCF to help provide education and mammograms to those in need. Here is a link featuring Peggy Fleming with her experience of Breast Cancer, and how Musselman’s is helping. So the natural applesauce is quite tasty, and tastes wholesome and pure. You can tell it’s made from the real deal- crisp, sweet apples and only apples. It’s not too sweet, and has a smooth feel, but still has a little texture to it (from all the grinded up apples, of course!!). It’s how natural applesauce should taste-without any added sugar, corn syrup, colors, dyes or preservatives. 1/2 cup is 50 calories, 0 grams of fat, 13 grams of carbohydrates, 2 grams of fiber, and 0 grams protein. Applesauce is also a good swap for oils and butter in baking, and adds mild sweetness to dishes. I’m an applesauce fiend . I eat it almost as much as I eat peanut butter 🙂 :). Seriously, I eat it on waffles, with my Amy’s Enchiladas, mixed with yogurt, pretty much every where! So, here’s a yummy recipe I was sent (with some of my own modifications!!) to use this delicious applesauce. 2. Line muffin tin with 12 papers or spray with non stick spread. 3. In small microwave safe bowl, melt butter on high for about 30-60 seconds, allow to cool slightly. 4. Sift together flour, baking powder, baking soda, cinnamon and salt into large bowl. 5.In another large bowl, whisk eggs and brown sugar. Stir in applesauce and melted butter until mixture is smooth. 6. Pour apple mixture over flour mixture. Mix with wooden spoon and fold in carob/chocolate chips. 7. Fill baking cups 2/3 way with batter. 8. Bake for 20 minutes or until light golden brown. So not only can you fight your munchies- but you can help Breast Cancer. What are you waiting for!? Would you like to win the gift basket I won? It includes the 48 oz. jar of Musselman’s applesauce, some recipe cards, and a pink magnet for your car, fridge, whatever, all wrapped up in a pretty pink-themed package! cool review!! these muffins sounds great! I substitute applesauce for some of the oil in my brownies and baking. I also mix in applesauce with my pancakes and put a touch of applesauce and cinnamon in my oatmeal. Thanks for the giveaway! YUM! It’s not a recipe but lately I’ve been digging applesauce, yogurt, pumpkin, and granola all mixed together! Actually, I just finished eating that! Pingback: Funky Monkey Oats-Recipe! « Healthy Product Reviews! !